After more than two years of stakeholder and public input, the Office of EMS at the National Highway Traffic Safety Administration and its federal partners today released “EMS Agenda 2050: A People-Centered Vision for the Future of Emergency Medical Services.” The document describes a vision for evidence-based, data-driven EMS that is integrated with the rest of the nation’s healthcare system. The principles and recommendations within EMS Agenda 2050 build upon, rather than replace, the groundbreaking EMS Agenda for the Future, originally published in 1996. The process to review and revise the original Agenda was first recommended by the National EMS Advisory Council, a formal federal advisory group of EMS representatives and consumers authorized by Congress to provide advice and recommendations regarding EMS to NHTSA and to the members of the Federal Interagency Committee on EMS. 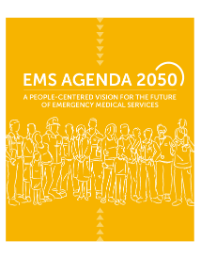 Throughout 2017 and 2018, the EMS Agenda 2050 vision was developed through a process that included several public meetings held across the country, online opportunities for input, and multiple rounds of public comment to provide feedback on drafts. Although the process was shepherded by a Technical Expert Panel, the goal was to involve as many members of the EMS community and the public as possible to accommodate multiple viewpoints and develop a vision that addresses key goals for the entire profession. EMS Agenda 2050 was developed with funding from the NHTSA Office of EMS, the Health Resources & Services Administration EMS for Children program, the US Department of Health and Human Services Office of the Assistant Secretary for Preparedness and Response, and the US Department of Homeland Security. Visit EMS.gov to download EMS Agenda 2050 and access other resources, including a brief video about the project and complete footage of the EMS Agenda 2050 National Implementation Forum, held at the Department of Transportation headquarters on September 20, 2018. To receive updates about EMS Agenda 2050, please sign up to join the EMS.gov email alert list.